A pretty useful application once you get the hang of it, AVS Audio Editor contains many cool functions but unfortunately also features a cluttered interface. It offers users all of the traditional effects many audio editing suites do such as fading, reverberation, echo, etc. It can record audio from various sources such as MP3, WAV, M4A, WMA, OGG, FLAC and can cut, trim, merge and split media files. Author also suggests using this program to create ringtones for your iPhone or other mobile devices. 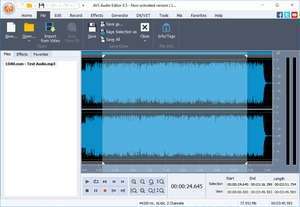 AVS Audio Editor 9.0.2.533 is a shareware program and can be used as a demo to try the software until the free trial period has ended. A full version of the program is available after the trial period ends. For security reasons, you should also check out the AVS Audio Editor download at LO4D.com which includes virus and malware tests. Additional screenshots of this application download may be available, too. AVS Audio Editor has a presence on social networks. AVS Audio Editor download been highly rated by our users.